The winners of the General Aviation and Glider Match Racing stepped up for their medals yesterday (December 9), at a ceremony held at the Sky Dubai Palm Dropzone. Polish glider pilot Sebastian Kawa claimed gold in the Glider Match Racing, after a thrilling final against Austrian Werner Amann. Tilo Holighaus of Germany took bronze. Before the ceremony Kawa joked with the crowd, throwing a model polystyrene plane around. "This is the best organised event I've been to," he said when we asked him about his time at the FAI World Air Games. "It's like the Olympics, it's really a special event. I'll remember it for a long time, because it is a celebration of our sports." Three golds were also given out for General Aviation disciplines: Landing Accuracy, Air Navigation and Top Air Navigation, for which the scores from the other two events are combined. Husband-and-wife team Frank and Cally Eckard from South Africa claimed gold in the Landing Accuracy, and the Air Navigation was won by Norwegian team Kurt Norevik and Petter Strømme. 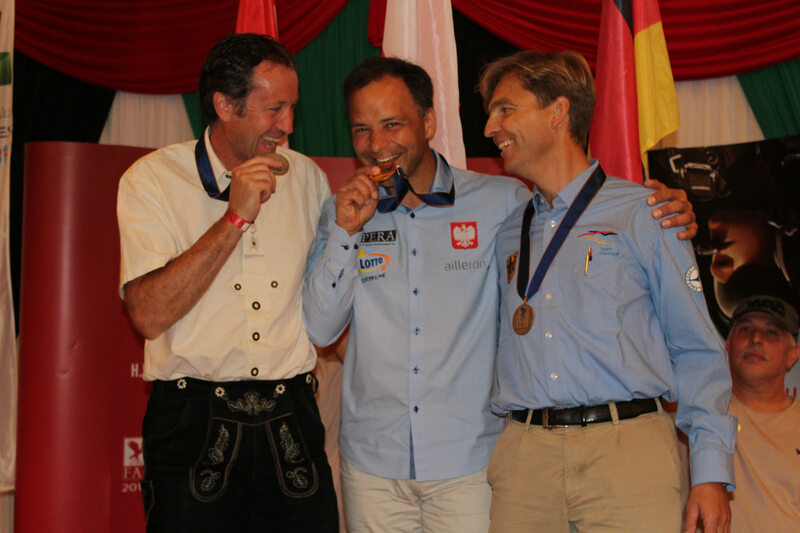 The overall Top Air Navigation gold went to another married couple, Germans Marcus and Astrid Ciesielski. Marcus Ciesielski said: "It was a very difficult landscape for everyone, because there were no references to find our way, and for the spot landing we had to fight a cross wind. But we had some luck, and were consistent." "It's an advantage being married," added his wife Astrid. "We know each other without words." The pair have been flying together since 2003 and have been married for almost 30 years.